Brave New Productions returns to the stage following the company’s most ambitious production, last year’s METAs Nominated “33 Variations”, to present an entirely new and unique theatre experience with “Sylvia” by A.R. Gurney. While the show currently enjoys a Broadway revival, Brave New Productions is excited to bring this hilarious and heart-warming story about a man and his dog to Montreal. Empty nesters Greg (Joseph Dineen) and Kate (Carolyn Fe) have moved back to Manhattan after twenty-two years in the suburbs. As Kate tells Greg: “The dog phase of my life is definitely over.” But life has a way of giving you what you think you don’t want. Greg finds Sylvia (Stephanie McKenna) , a street-smart lab/poodle mix, and brings her home. She promptly becomes a bone of contention between Greg and Kate, testing their marriage to hilarious and touching effect. Directed by BNP Artistic Director Emma McQueen, “Sylvia” features an all-star cast of Montreal talent including Stephanie McKenna (“The Rocky Horror Show”, “33 Variations”), Carolyn Fe (“P4W”, “Far Away Tales, Close To Home”), Joseph Dineen (“Shakespeare in Hollywood”, “Not Now Darling”), and Donald Rees (“Mistakes Were Made”, “ART”). “Dramatic literature is stuffed with memorable love scenes, but none is as immediately delicious and dizzy as the one that begins the redeeming affair in A.R. 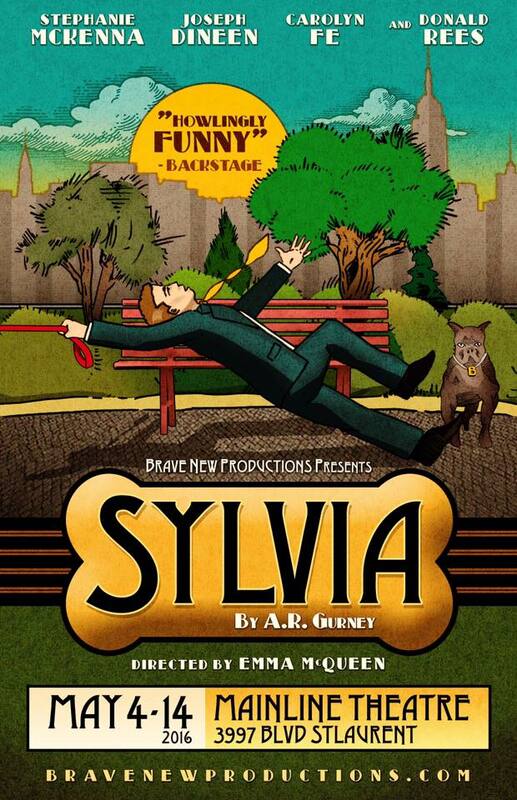 Gurney’s new comedy, SYLVIA…” —NY Times. “I can only call it one of the most involving, beautiful, funny, touching and profound plays I have ever seen…” —NY Daily News. Featuring an original score by Ian Baird, “Sylvia” opens May 5th and runs until May 14th at Mainline Theatre (3997 Blvd StLaurent). Tickets are $20 and are available starting April 4th, 2016 at noon online via the MainLine Box Office and by phone at 514-849-3378.